The FamiliesAndSocieties project is organized in 12 work packages. The WPs have been designed to complement each other and interrelate, as shown in the Figure below. WP1 (management) and WP12 (dissemination) serve all WPs, providing a frame for the research activities (WPs 2-11). Important aspects of the family life course are addressed in WPs 2-4. New family configurations, life goals and transitions being specifically addressed in WP2, the new roles of women and men in WP3, and the new role of children along with ART in WP4. WPs 5-9 address the implications of the changes in the family life course for sustainable societies. WP5 focuses on inequalities in children’s life chances, WP6 on childcare arrangements, their determinants and consequences, WP7 on intergenerational links, WP8 on migrants and questions of social inclusion and exclusion, and WP9 on policies. Foresight and synthesis of research results constitute another group, the former activities included in WP10 and the latter in WP11. 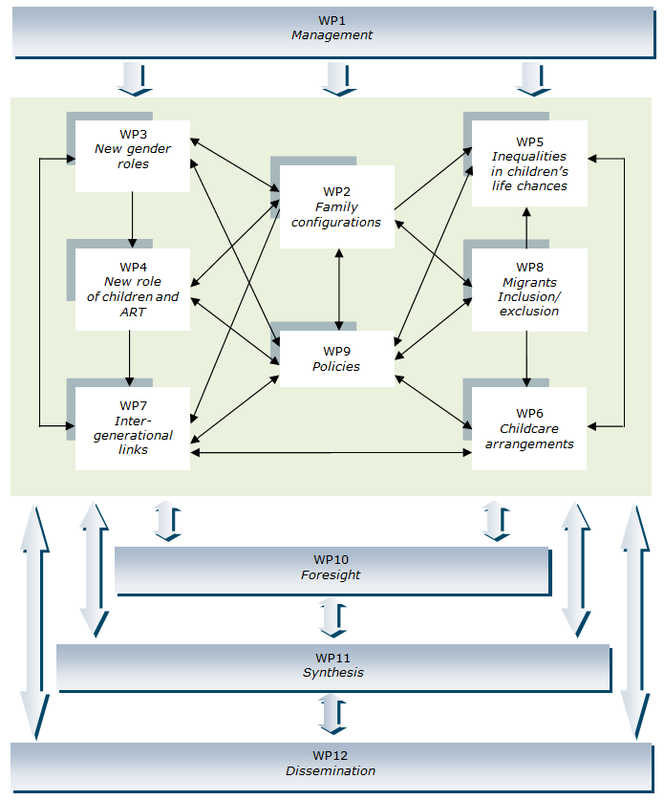 Two of the research WPs are central ones and interlink with all other research WPs; these are WP2 on family configurations and WP9 on policies. The new gender roles (WP3) interlink with WP4 (children and ART) and WP7 (intergenerational links) in addition to links with the two central WPs. WP4 also interlinks with WP7, the latter connects to WP6 as well. WP5 on children’s life chances interlinks both with WP6 and WP8.